I am general contacting my own house. I have extensive building experience from the after framing stage onward, so I have hired a contractor to build the concrete foundation and to frame; areas I am not experienced in. I have a 9' concrete pour foundation wall on a concrete spread continuous footing. Is rebar required in the footing and wall system? If so, generally how much? Hard clay based soils in area.I assume a 10" deep footing. Should I go with a 20 or 24" wide footing? Should I go with a 10" foundation wall? Yes footings needs reinforcements for two reasons, strength and shrinkage. 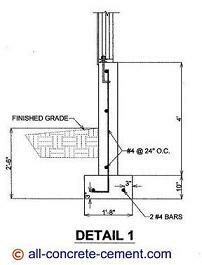 I would use 10 inch thick by 20 inch wide with 2#4 rebar at the bottom, placed about 3 inches from bottom of footing the same way it shown on detail 1 below. This detail specifically show 4 ft high foundation wall but its the very same detail being used for up to 10ft high foundation wall. You will need reinforcements for foundation wall, I would use 8 inch thick wall reinforced with #4 at 18 inches on center each way, meaning #4 vertically spaced at 18" on center, do the same with the horizontal bars. The 8 inch foundation wall is plenty strong for any residential up to 3 stories high. If you want to go 10 inches, it's only going to cost a little more money due to more concrete used but as far as strength, 8" thick should be enough for the job. Make sure to use dowls to footings about 30 inches long with a 4 to 6" long leg to be placed on the footing with enough lap splice for the vertical reinforcements to be tied to. For horizontal reinforcements, make sure to over lap them at least 20 inches anytime two sticks are connected, same at corners too. Don't forget your anchor bolts and hold downs to anchor your new house to the foundation.